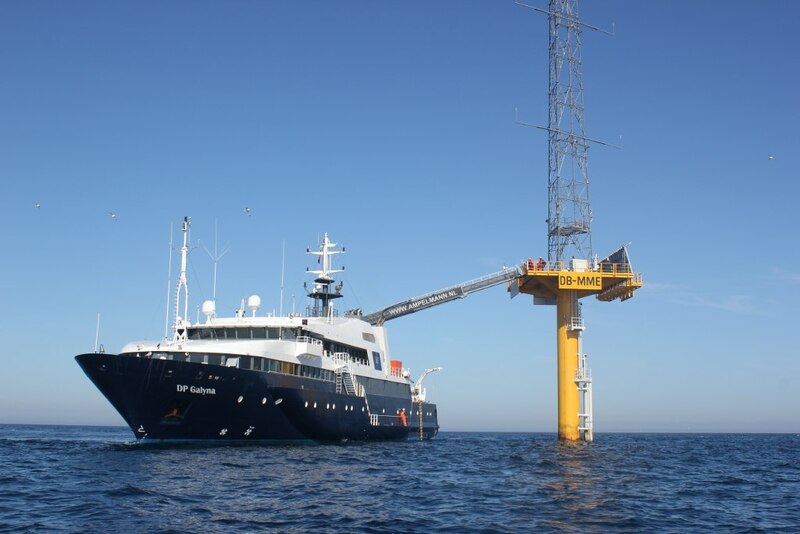 Walk-to-Work Offshore Support Accommodation vessel DP GALYNA was contracted by Forewind for operation and maintenance work to its two meteorological masts on North Sea’s Dogger Bank, located approximately 150 km off the east coast of Yorkshire. DP GALYNA sailed to Great Yarmouth to take on board the technicians of SeaRoc Group for scheduled operation and maintenance of the masts and its instrumentation and proceeded to the offshore location. The vessel’s fixed Ampelmann walk-to-work access system allowed the technicians to board the platforms of both masts in a safe and time efficient way, perform their tasks and enjoy the comfort of DP GALYNA’s high standard accommodation and catering facilities. Favorable sea and weather conditions contributed to a smooth operation and the required work was accomplished early without any incident or loss of time and within budget. Forewind’s two meteorological masts - Dogger Bank Met Mast East and West - provide essential wind, wave and other weather information, as well as marine traffic data for the Dogger Bank offshore wind energy development. Forewind is a consortium comprising four leading international energy companies, RWE, SSE, Statkraft and Statoil, which joined forces to bid for the Dogger Bank Zone Development Agreement as part of the third license round for UK offshore wind farms. Chevalier Floatels is a young energetic company with ten years of experience in the floatels industry.Projects and vessels are managed in such a way to help the customers meet their schedules and budgets.Chevalier Floatels has successfully built, owned and operated floating accommodations from five star floating hotels with full facilities to worker accommodation barges, to floating prisons for governments. In response to the growing renewables market, Chevalier Floatels has developed a new design concept for staff accommodation and transport to offshore energy installations resulting in the introduction of DP 2 offshore support vessels DP GEZINA and DP GALYNA. Our offshore support walk-to-work accommodation vessels are designed for installation and maintenance projects in the offshore wind, oil and gas industry. An Ampelmann personnel transfer platform / walkway, which actively compensates for all vessel motions, is specifically located at a position on the bridge deck that provides optimum access to platform entrances and working decks, both over portside and starboard. Both vessels have a high level of reliability, efficiency and comfort. The wellbeing and comfort of the crew and technical staff onboard is paramount. However, there is as well significant focus on reducing clients operating costs (the vessels are extremely fuel efficient) and environmental aspects (low exhaust emissions). DP GEZINA and DP GALYNA are the economic solution from 30 miles offshore for safe platform access and increase of effective production hours.